I was drafted into the Army in July 1965 and turned loose in May, 1967. In July, 1966, I was in Vietnam. I served in the 1st Logistical Comman in Qui-Nhon. I was assigned to a supply company in the valley on HWY 19, 25 miles outside Qui-Nhon, as the courier-mailman. This required me to drive from Qui-Nhon twice a day to pick up mail and take care of all correspondence from our company to Battalion Headquarters. When I became "short, I became the Company Draftsman. My drafting abilities helped me secure this position. Drawing yard plans and revising was the norm during that period. Through th eyears, talking with many Vets, we remembered times when American beer was scarce. 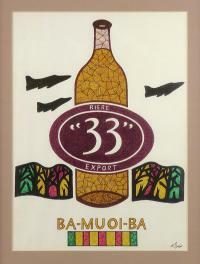 The French imported "33" Biere. The Vietnamese copied the beer, as they did Coca-Cola, but the stuff was terrible, causing bad headaches and unspeakable hangovers the next day. We drank it anyway and paid the price. In 1985, I drew this lampoon of the fabled brew. The art style is crosshatch. The F-4s are on a run, the forest is alive with explosions and the colors are in sync with the Vietnam service bar we wore on our uniforms. The Vietnamese called the beer "Ba Moui Ba." I dubbed the piece "Flowing Thunder" after the operation "Rolling Thunder" which is quite well-known today. The GIs in Vietnam in the earlier years didn't understand the scope of the war. We did our jobs and counted the months, then the days 'til we would DEROS (Date of Estimated Return from Overseas). I came to wonder...why are we here? When I shipped out to Vietnam, I was alone. When I came home, I came home alone, at 4 a.m. The only time anyone said to me "Welcome home" was another vet. My folks, my friends, nobody ever asked me about RVN ever again.